You always said you would try one someday. Maybe you caught the Kona broadcast over the years and thought, “Let’s do this!” Perhaps you’re a single sport athlete who is getting bored or frustrated with an injury. Triathlon sure looks like fun? (It is!) But gosh, it also looks overwhelmingly complicated. How in the world do I get started? Joining a tri club is a great way to be introduced to the sport. 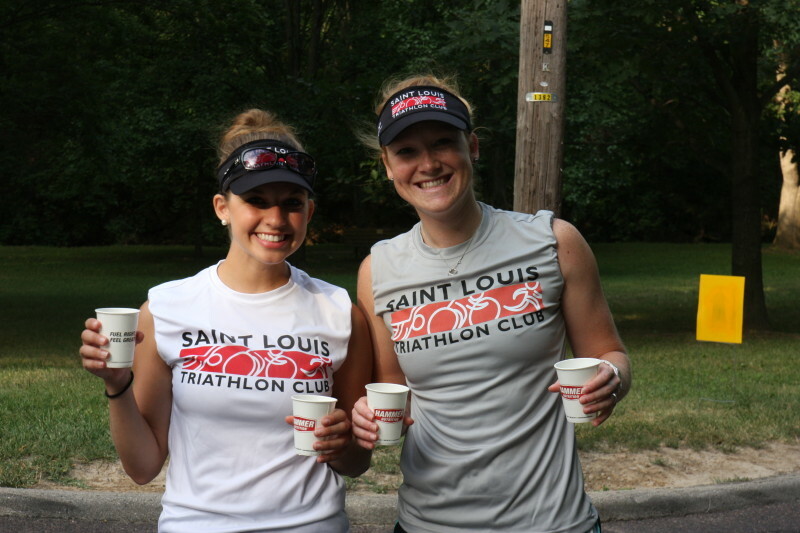 What can the St. Louis Triathlon Club offer you? 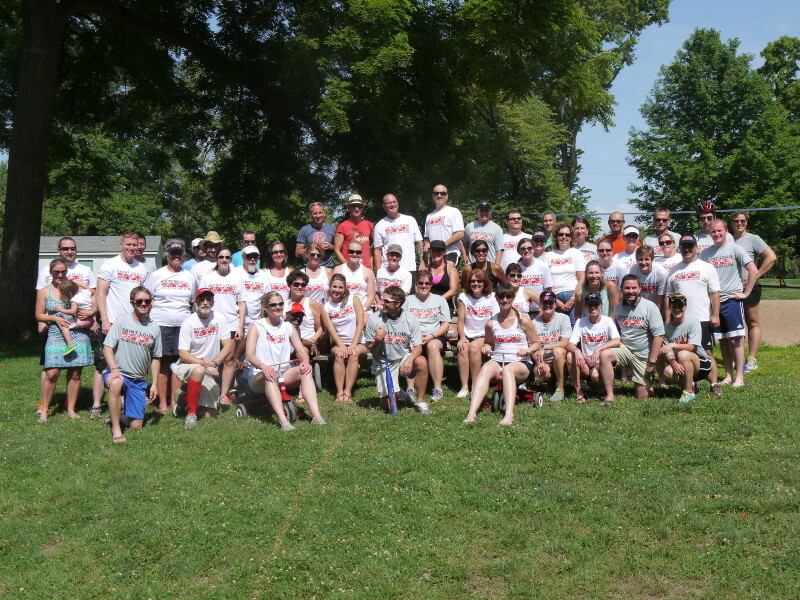 Take a look at the above group photo of our club’s members from our recent summer picnic. Can you pick out the multi-ironman finishers? Can you pick out the newbies who just completed their very first sprint triathlon? They’re all in that photo. There’s no need whatsoever to feel intimidated in becoming a part of this club. Instantly connect with new friends and training partners – Yes, technically you will race as an individual on race day, but there are no rules that say you have to go it alone in the days, weeks, and months leading up to your race day. Our club members range in age and experience from the brand new multisport athlete to the veteran iron-distance finisher and everything in between. You will find someone who trains at a similar ability or pace. Monthly social events are also a great way to connect with fellow club members. Gear up and race at a discount – You’ll need a few essentials to begin training and racing and you can take advantage of the discounts offered by our fantastic sponsors for bikes, gear, running shoes, etc. to get you to the start line. Our sponsors also offer our club members discounted race entry on certain races so you’ll also be able to race without breaking the bank. You will easily recoup your membership fee and then some over the course of the year just by taking advantage of the various discounts offered to all club members. Mentoring program – Triathlon can be overwhelming for a newbie. This program is developed to teach you what you need to know. We can’t do the training for you, but we can provide you with skills and knowledge you’ll need to be ready to roll on race day. Weekly no-drop rides. Lots of clinics: tire-changing, bike-handling, open water swimming, transition, what-to-wear, race fueling and nutrition, etc. All in a supportive and low-key environment. Group Training opportunities – We organize weekly group rides, bricks, and runs. Training with a group is a great way to get to know your fellow club members and the accountability factor is a sure-fire way not to slack on your training. Support on race day and beyond – Become a part of the club and you become a part of the team. There are no requirements to tryout. Not only will you hear the cheers of your fellow clubmates on race day, but you will also experience the encouragement during those long and challenging training days. Utilize the club’s many resources: our website, message board and social media, travel bike boxes, race calendars, and the combined knowledge and experience of over 400 members.